Take the time to frequently inspect your tires for sidewall and tread groove cracking, punctures, blisters, knots, cuts, excessive or irregular wear. As with tire pressure, it only takes a few minutes � every time you ride is not too often. If you do find any of these tread wear conditions, immediately replace the damaged tire. In addition, most tire safety experts recommend replacing rather than attempting to permanently patch a tire. If you store your motorcycle during winter months, be sure to store it in a cool, dry place, out of direct sunlight � and away from ozone-producing appliances (anything with an electric motor, such as a refrigerator). Additionally, your tires should not come into sustained contact with gasoline or oil. Improper storage will rapidly accelerate the normal aging process, making your tires unsafe. Make sure you get a matching set of front and rear tires. 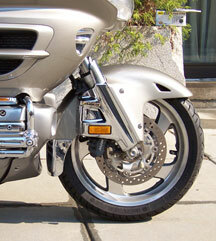 Unlike car tires, you need to make sure that your motorcycle tires are a �matched� set. At a minimum, they should have complementary tread patterns, should both be either radial or bias ply, and ideally be the same make and model.